Cobra Command is an action game developed for the NES and published by Data East in 1988. This title is similar in nature to, but distinct from, the Cobra Command (1988) arcade game developed by Data East (which itself is distinct from the 1984 laser disc arcade game Cobra Command, also developed by Data East). 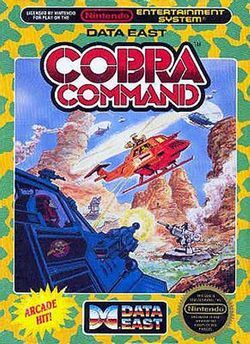 Cobra Command is a side-scrolling game in which you pilot a helicopter in an effort to rescue prisoners of war from various locations around the world. Taking many cues from Choplifter, you must lower your helicopter in order to drop a rope which allows prisoners to climb aboard. Various upgrades to your weapons and defenses can be found by touching down on particular indoor platforms. This page was last edited on 29 November 2014, at 21:02. This page has been accessed 4,102 times.